Stylistic awareness, precious materials matched with taste, open solutions that adapt to any space, functional customisations to render each project unique. The G180 model allows creating essential and sought-for lines, composing the total or partial cuts of the handles obtained on the door’s profile. The steel and rovere termotrattato wood of this composition combine elegance and technical expertise. 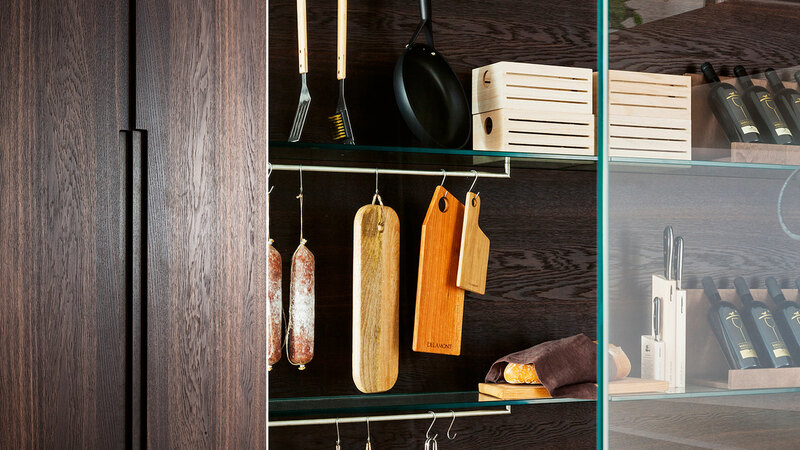 The crystal pantry features matching boiserie and custom shelves, also in crystal. In the new catalogue, G180 is presented as a composition consisting of island, columns, and angular equipped wall. 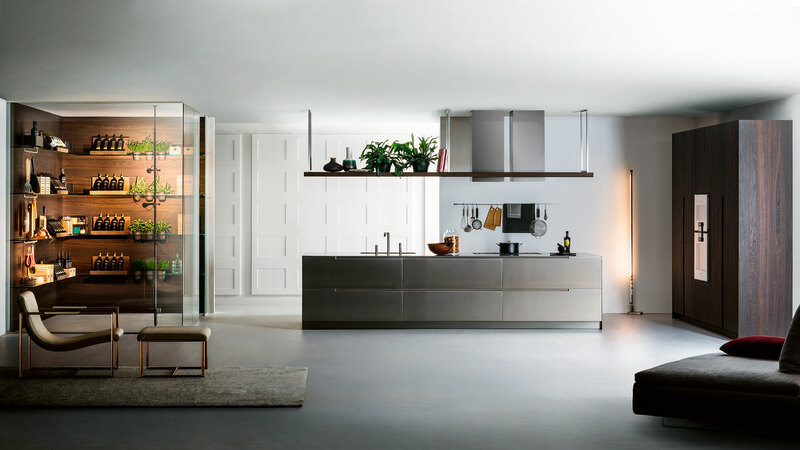 The large central island built entirely in steel features bins and drawers. 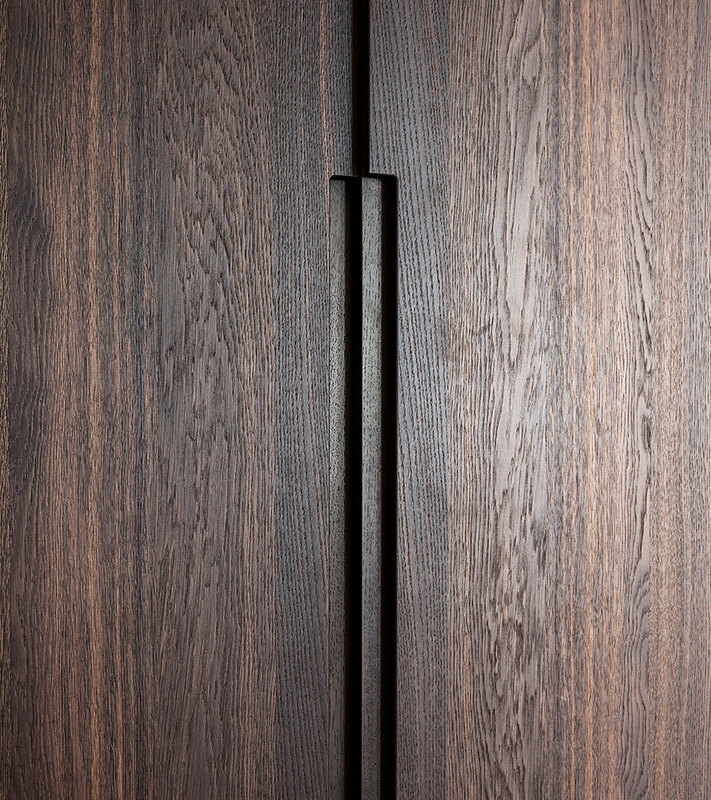 The G180 model doors retain the continuity of the groove between the various fronts. The top in acciaio satinato of 4 mm thickness envelopes the island also on the sides and features an electro-welded sink and built-in 5-burner hob. The suspended double hood supports a large shelf in rovere termotrattato that joins ideally the columns to the boiserie, made in the same material. The pantry features angular boiserie and modular crystal shelves. The shelves can be of various length, they may customized with holes to host containers or with bars to suspend objects or foods. The linear composition of wall columns features doors with partial vertical groove that recall the workmanship of the bins. The five-column integrate refrigerator and freezer, oven, compact oven, pantry compartment. The compartments feature full-height stripled lights with twilight switch. 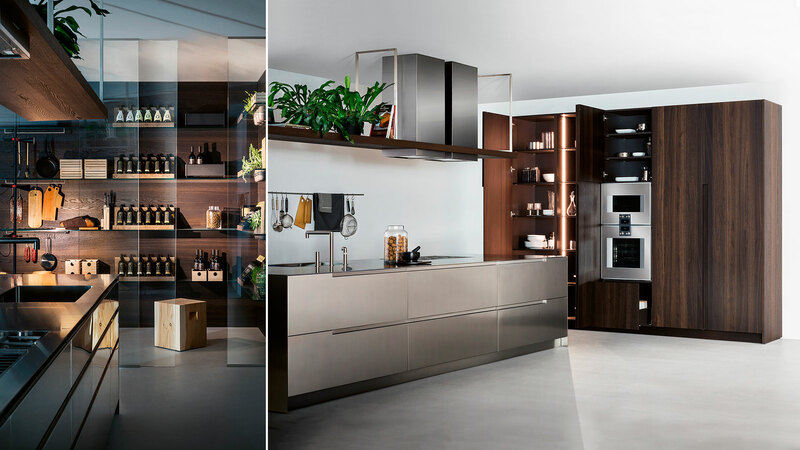 The G180 model doors are milled on the side to allow opening, without additional elements: a detail that ensures utmost formal neatness thanks to the use of a single material on the whole front and, in case of wood essences, with vein continuity. 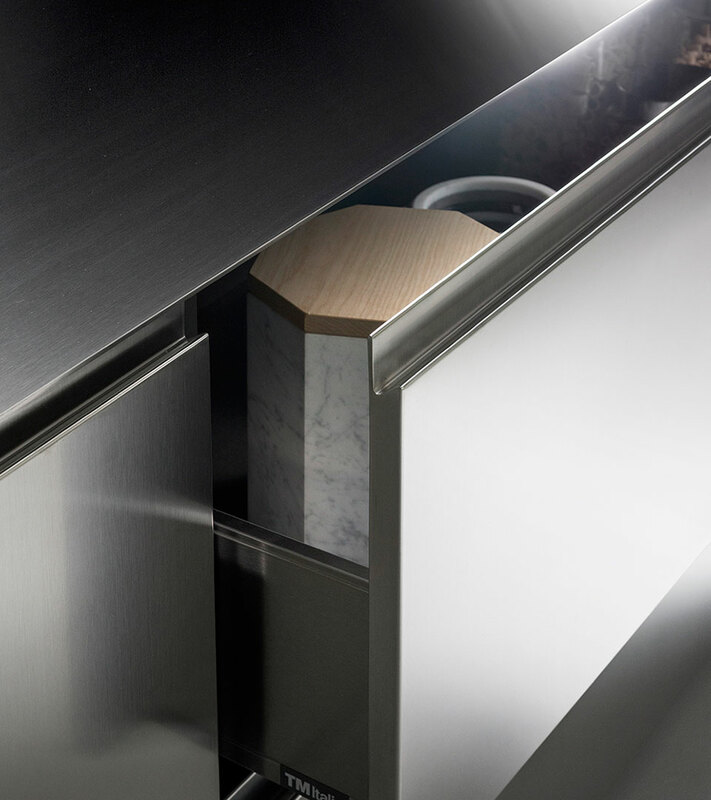 The worktop in acciaio inox satinato is 4 mm thick. Its surface is specifically machined to integrate the filotop gas hob and entirely electrowelded sink without any visible joints. It unveils the thickness and acquires utmost visual lightness on the edges. In this composition, the combination with acciaio satinato of the fronts is embellished by the presence of steel details in the internal components. 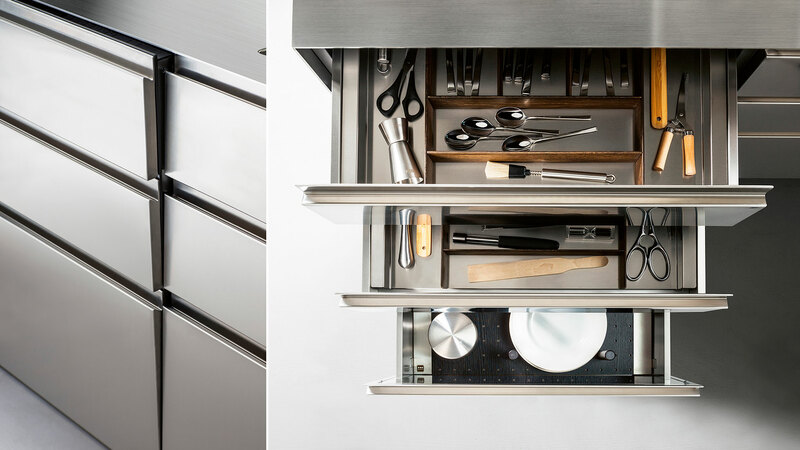 G180 is a modular kitchen system. Doors and fronts can be 22mm or 28mm thick, featuring a groove machined from solid material on one edge as a grip for opening. The remaining edges are straight. In cases where two adjacent doors/fronts have contacting grooves, one of them will be replaced by a counter-groove. The wall units of this concept are provided with a grip handle recessed on the bottom structural panel.